On a recent inspection to a home in Broomall Pennsylvania, I was asked to look at a property that had a major water loss. The restoration was done by a franchise competitor of ours, but the owners had concerns which weren’t answered by the company their insurance adjuster urged them to use. Water Damage Restoration is the process of restoring a property back to pre-loss condition after sustaining any level of water damage. This requires removal of materials or items which are beyond restoring and “drying out” others including the structure. In this case, the restorative company came in and within hours were finished by basically just setting up a considerable amount of equipment for 5 days. Remember, every company, including us at Mold Solutions & Inspections, get paid for each piece of equipment on a daily basis. So the larger the area of loss, the more equipment will be needed, and hence more charges. But in this case, the picture (which shows a non-probing moisture meter) in close proximity to the loss, the restoration company clearly didn’t do their job. 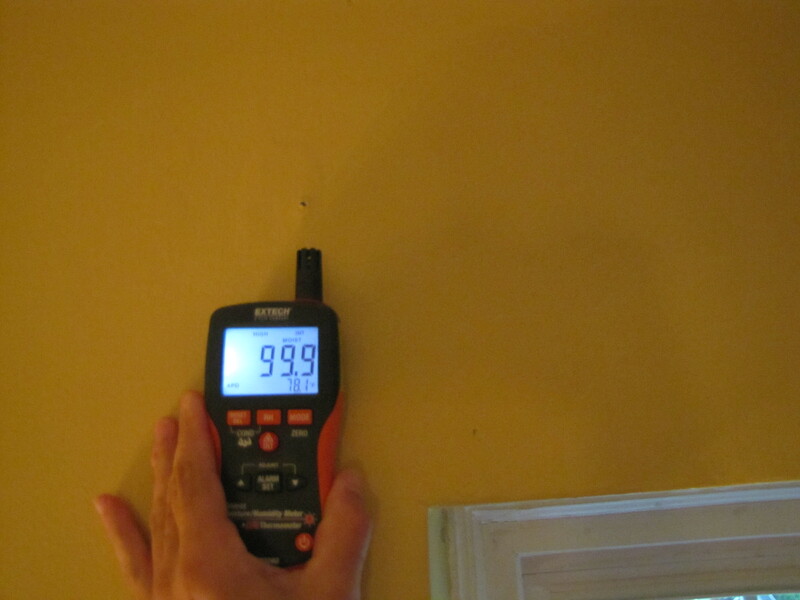 The meter shows the highest level possible behind the plaster and the concerns of the home owner were warranted. You must be sure that when you hire a disaster restoration company, that they follow through with all of their responsibilities, and also know you can hire whichever contractor you desire and the insurance company can not do a thing. This claim was luckily reopened and we performed the restoration properly and the structure was completely dried when we were finished. visit our website at biowashing.com for more information.